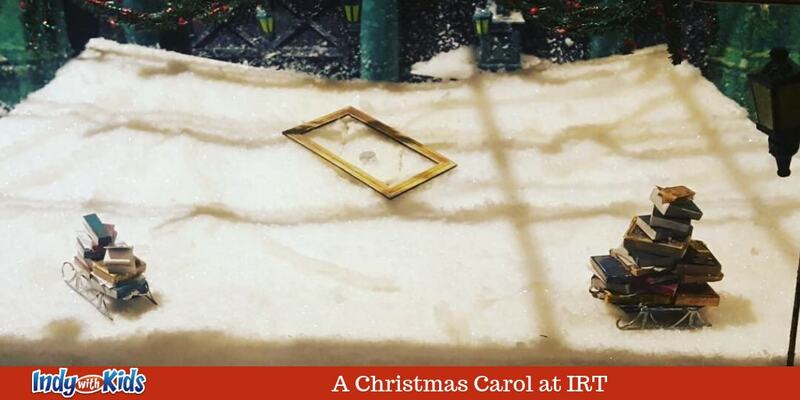 This year’s annual production of “A Christmas Carol” opened Saturday night at the Indiana Repertory Theater (IRT). My daughter and I had the privilege of attending this performance and we were both absolutely delighted! I will admit that I hadn’t been to IRT since my own school field trip days, so I was very excited to share in this experience with my 7-year-old, who had never been. We arrived early to give ourselves time to explore the historic building – listed on the National Register of Historic Places – and I’m so glad we did! Not only did we enjoy scoping out all of the cool architectural details throughout the lobby, but we learned a lot about the production as well! The second-floor mezzanine currently houses several displays for this season’s shows, and the “A Christmas Carol” display included information about the cast, the lighting design, the set design, and all of the gorgeous costumes! There is also an original painting depicting Ebenezer Scrooge with the three ghosts who visit him that will be auctioned off later in the season to raise money for future productions at IRT. The show itself depicted the traditional tale of Scrooge with a little humor thrown in to generate some laughs. The cast and crew very creatively made the most of the smaller stage, utilizing the same scenery for the entire show but changing things up with lighting and props to set the mood. Several of the actors play multiple roles, but you hardly even notice because of the amazing costumes! My daughter especially loved clapping and singing along with some of the traditional Christmas carols sung during the play. Attending this show will likely be added to our list of annual holiday traditions from now on! Be aware before you go that the show has a running time of 90 minutes with no intermission. Take your littles to the restroom before finding your seats! My daughter grew a little bit antsy by the end, so I would recommend attending a matinee; the evening performance ended right at her usual bedtime.